We play a lot of board games in our family. In fact, there's a 6-foot tall cabinet in the living room dedicated to housing our massive collection of puzzles, cards, and games. The baby loves to reorganize this for us when we're not looking. But as I was playing Disney Frozen Surprise Slides (like Candyland but worse) with my daughter, I realized that I don't really like all of them. 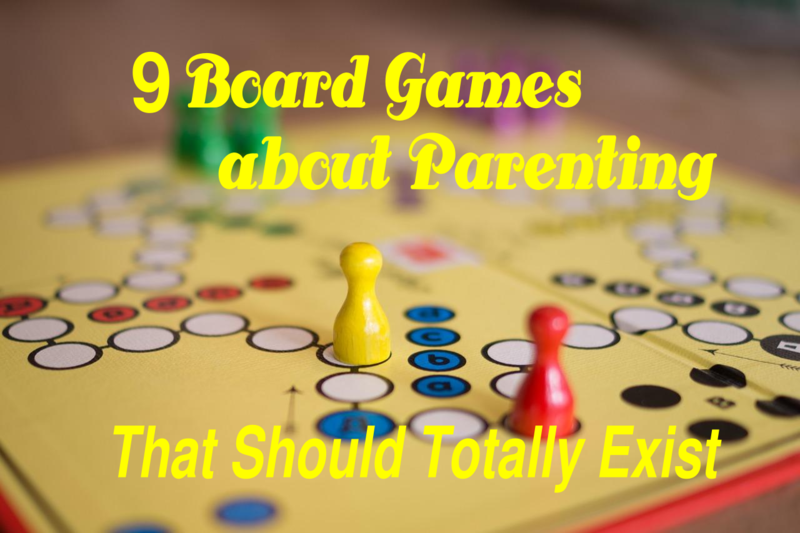 If I could stock our game cupboard with games parents actually like to play, you might find some of these old favorites on the shelves, instead. How good is your poker face? Can you pretend you don't know the baby's Pampers are totally loaded and successfully hand him off to your spouse? Just be careful — you never know who else is playing this wickedly deceptive game of double-crossing! Grab your romantic partner and get ready! Work as a team in this fast-paced game of wits as you race against the clock to set the mood and do the deed before the buzzer starts calling "Mooooommmmmyyyy..."
Uh oh! Somebody's starving in your cart in the middle of Target! Can you stave off a temper tantrum with the half-empty bag of Goldfish in your purse? Or will you have to abandon ship and start over? Only the resourceful can survive this slapdash game of speed shopping where every minute counts. You've played Guess Who, now it's time to try Guess What? Put your stamina to the test as you listen to your preschooler ask "Guess what?" 500 times in a row. Earn points for not glazing over and responding "uh huh" on autopilot. Last one standing wins! What will your kids do when you say "If you don't clean up your room, we're not going to the park with Emily?" Are you prepared to sacrifice your only adult interaction of the day talking to Emily's mom? Of course not! You're already a natural at Hollow Threat Bingo™. Score 5 hollow threats in a row, and your kids won't believe you ever again! On your mark, get set, go! It's time to see how fast can you identify that childhood rash. Can you stomach the pictures on Google? Will it be viral or bacterial? Wait to call the pediatrician if you dare, but watch out! You might have to make an extremely inconvenient visit to urgent care when it gets worse over the weekend. Do you have the guts to open that Tupperware shoved in the very back of your refrigerator to see what could possibly be inside? Play this thrilling game of what-ifs, risks, and courage. Will the whole container go straight into the trash, or are you brave enough to peek inside? It's the classic head-throbbing, soul-crushing game of exhaustion that generations of parents just can't stop playing. Up all night? No problem! The more tired you feel, the easier it is to rack up Narcolepsy points by falling asleep anytime, anywhere. But in this game of skill you'll also need a twist of luck: avoid the Insomnia card or you'll lose them all. Draw the Crying Baby card, and you're out of the game. And if you get to finish your candy bar, you win the game! I love that one! I love these classics! The Hungry Hungry Hellions is just as much fun, in the bonus round as grandparents! Even better, probably, because you can let mom and dad deal with the sugar crash or caffeine frenzy or whatever you're getting them hopped up on so you can finish shopping! Maybe I'll look into setting up an Etsy store or something. How are these not in existence, because I believe I have been actively playing these games for 13 years now!! Night owl, perfectionist, mom of 6, and member of the Church of Jesus Christ of Latter-day Saints. Sometimes I make it to appointments on time. But don't count on it.